Join #teambrainandspine for the UKs most popular cycling event. You will ride this incredible 100 mile route on fully closed roads, making for a truly unique experience. After testing your legs in the Surrey hills you will cruise back into London to finish on The Mall, with the professional road race finishing in the same place just a few hours later. Former winners of this event include Mark Cavendish, so you can soak up the festival atmosphere at the end of the ride and watch the top professionals duke it out – cold beer optional! Being on closed roads makes this event suitable for all levels of rider, for full details on the event please click here. A celebratory post ride meet up for cold drinks, food and photos. How can I join #teambrainandspine? 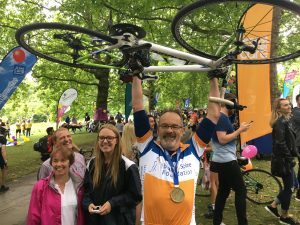 If you have been lucky enough to secure your own place in the Prudential Ride London 100 or 46, and would like to ride in aid of the Brain & Spine Foundation please call 020 3096 7880 to connect with our team. You will still have access to all the benefits of being part of #teambrainandspine as listed above!